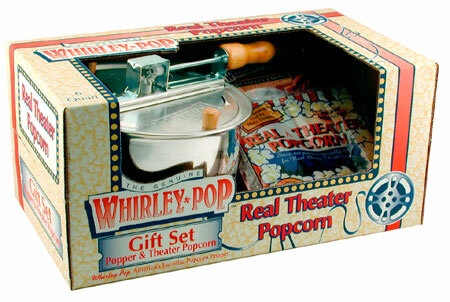 Whirley-Pop Real Theater Popcorn Gift Set... Stir up popcorn perfection with Whirley-Pop Stove Top Popcorn Popper with Real Theater "secret ingredient" popcorn. Enjoy healthy, delicious, great tasting popcorn every time... quick & easy with the Whirley-Pop! This complete popcorn lover's set is beautifully boxed & is a great gift to send family, friends & clients! Aluminum pan with hardwood handle and knob.